Cut velvet home furnishings fabrics in earth tones have a woodland palette of greens and golds and browns that is quite sumptuous (sorry-picture colors may be a bit sharp; did not photo well; actual quilt is warm toned golden and forest greens). Small scale (the blocks measure about 3") jacquard floral weaves are arrayed in a classic BOWTIE pieced pattern joined with a 1/2" wide sashing . 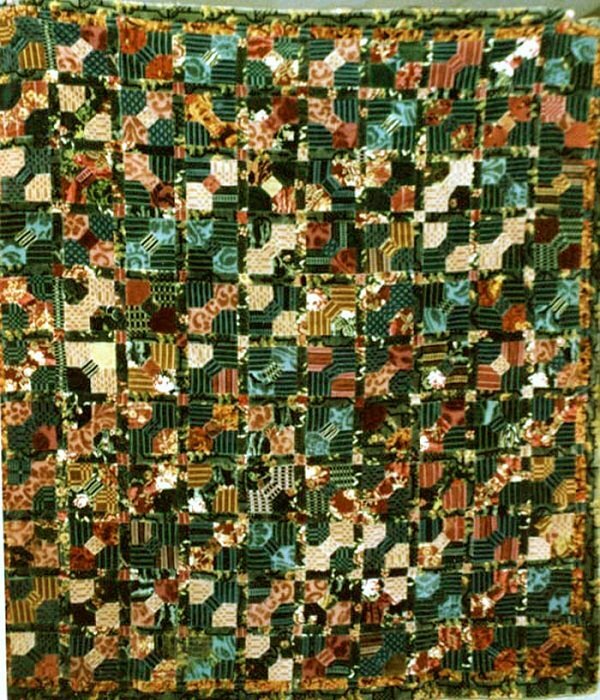 Colors much richer in person; fabrics were for home furnishings like draperies, upholstery, or clothing outerwear, at the turn of the 20th century. Quilt is not bulky, it is supple and lightweight. A best-of-kind example; of the few I have encountered, they had no real pattern, were merely swatch collections.